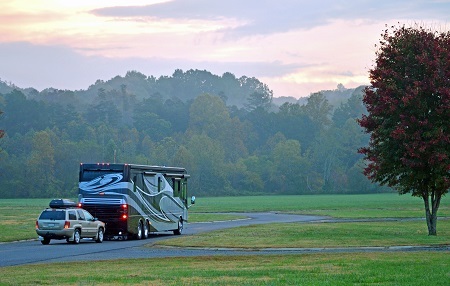 If you dream of taking your home on the road, a Class A motorhome is likely the choice for you. A Class A motorhome is a specially designed coach that sits on a bus style chassis. Class A's typically offer additional space through a series of slide-outs that expand the living space once parked. Class A's range in length from 30 to 45 feet and are a standard eight-feet wide before slides. Slide-outs vary from coach to coach, but can stretch the full length of the rig and increase the living space by up to 100 square feet. Class A's can be 12 feet tall with large basement storage compartments perfect for storing your outdoor furniture and recreational toys. Roomy Interior – Class A motorhomes are known for being the most spacious RV. 45-foot units with slides provide up to 400 square feet of additional living space. Luxury at its Finest - Class A motorhomes are well-appointed and offer nearly every amenity available. Ease of Access - Class A's offer living quarters that are readily accessible to the driver and guests can easily enjoy the coach while the motorhome is moving. Automatic Systems - Class A motorhomes feature automated hydraulic systems that allow the driver to level the coach and expand the slides without ever going outside. Comfortable Coach - Class A's offer superior riding comfort for passengers while traveling.